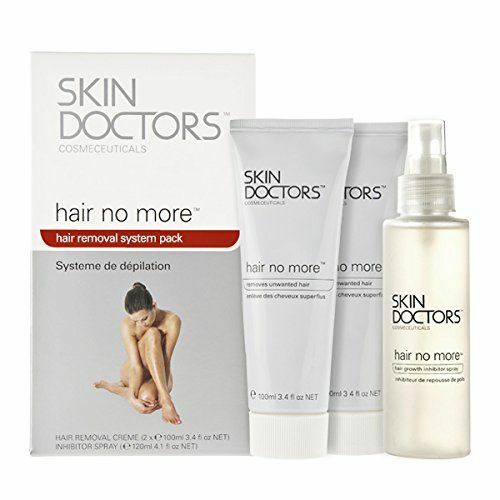 Skin Doctors Hair No More System Pack is a long-term hair removal system that is completely pain free. It gently and painlessly removes unwanted hair in a matter of minutes and also prevents the hair from growing back. If used regularly, Hair No More™ Inhibitor Spray makes hair grow back sparser, finer and lighter than before, and in some cases the hair doesn’t grow back at all. 3. Leave for 2-3 minutes (face), 4-5 minutes (body) then remove a small area of cream using the spatula. If hair comes away easily the cream has been on long enough. Some hair may take a further 1-3 minutes. Do not exceed 5 minutes for the face and 8 minutes for the body.Do not guess the time, always use a watch. Do Not allow the cream to dry onto the skin. 4. Step 2 – Inhibitor Spray. Once the skin has dried following depilation, spray the intended area with a fine mist. Apply enough spray to saturate the area and then massage into the skin until fully absorbed. If applying to a sensitive area (ie – close to eyes or mouth) spray onto a piece of cotton wool first and then apply to the application area. 5. Use daily for the first week and twice weekly thereafter to maintain hair retarding action. Apply more often if the hair is thick and dark. Witch Hazel - helps in the healing of damaged skin. An excellent natural astringent giving skin a refreshed and smooth feeling. Hypericum - this herb is also known to soothe the skin when used in a topical form, and when used with Witch Hazel they create a powerful but natural analgesic. 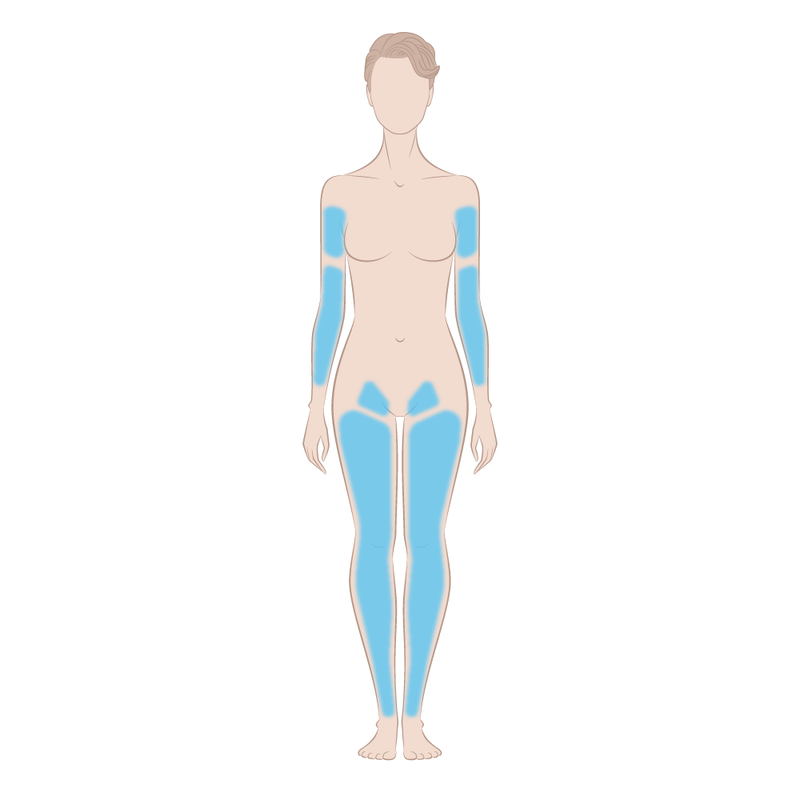 Prior to use, patch test on a small section of the treatment area and wait 24 hours. Take special precautions if applying to the face: patch test on a small area (2cmx2cm) and wait 24 hours before proceeding with full applications. Discontinue use if allergic reaction or irritation occurs. Avoid eyes, mouth, inflamed, sun burnt or broken skin. For external use only. In the event of contact with eyes, rinse immediately with plenty of water and seek medical advice. Product contains alkali. If irritation occurs please stop using the product immediately. Contains Thioglycolate. Follow instructions. Keep out of reach of children. Step 1-Fast, easy, pain-free hair removal cream only takes minutes to work. Blade free razor glides off the cream and hair- no pain, no nicks, no dryness! Step 2- No More Hair Inhibitor Spray helps minimise hair regrowth. Any hair that does grow back appears softer and sparser than before. Hair No More depilates the hair melting it away within minutes, plus Inhibitor Spray helps to reduce the regrowth of unwanted hair. The results will vary depending on the hair thickness the quantity being removed, as well as how often Inhibitor Spray is applied. How long will it take for the hair to grow back after using the Hair No More System? The timeframe is very individual. To optimise the effect, the System should be used regularly. Does Hair No More System have any side effects? Not if used precisely as instructed. Otherwise, burning and irritation could occur.